Finally we managed to get a handful of warm to hot days in the last two weeks but it was only fleeting as the temperatures have dropped again, typical of this year’s unusually mild summer. My passion for reptiles has resulted in me studying the weather forecasts every day hoping for a warm sunny day to bring them out. The last two weeks definitely lived up to my expectations. The first of the hot days we were working for a client in wet forest near Trafalgar. 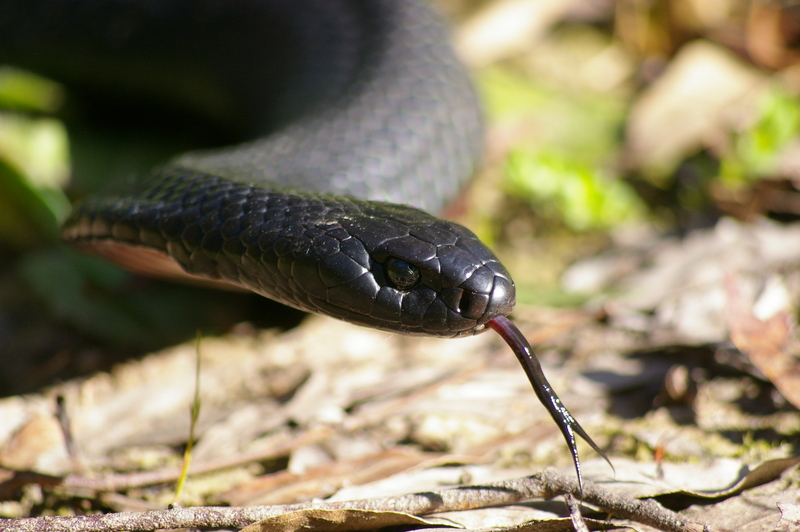 While walking through an open section of the forest where sun was streaming through I came across a fully grown Tiger Snake Notechis scutatus. It was partially hidden in vegetation but I managed to snap some photos of it’s head. 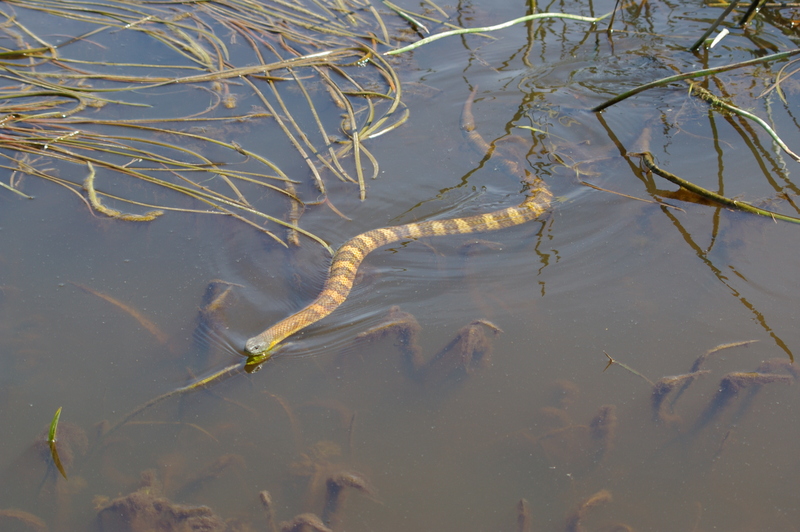 It seemed unperturbed by me and sat there while I composed my shots before finally slithering off slowly. 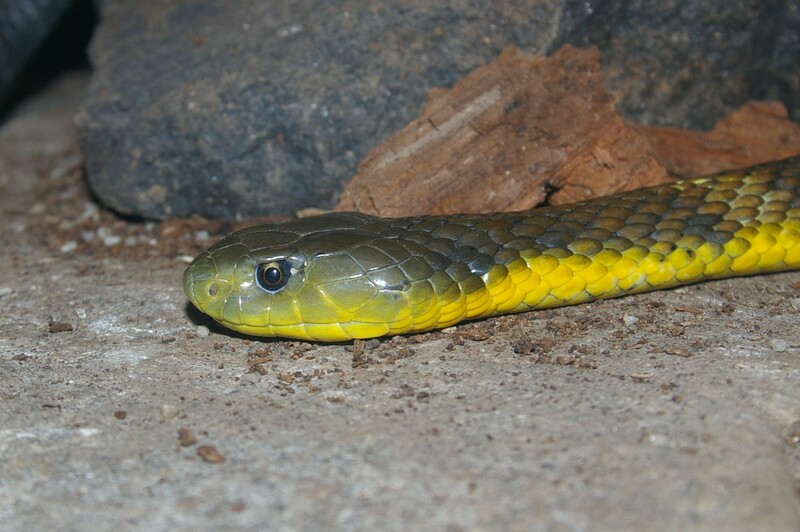 I’ve noticed in the past with very large, fully grown snakes that they are less frightened by people than younger snakes. 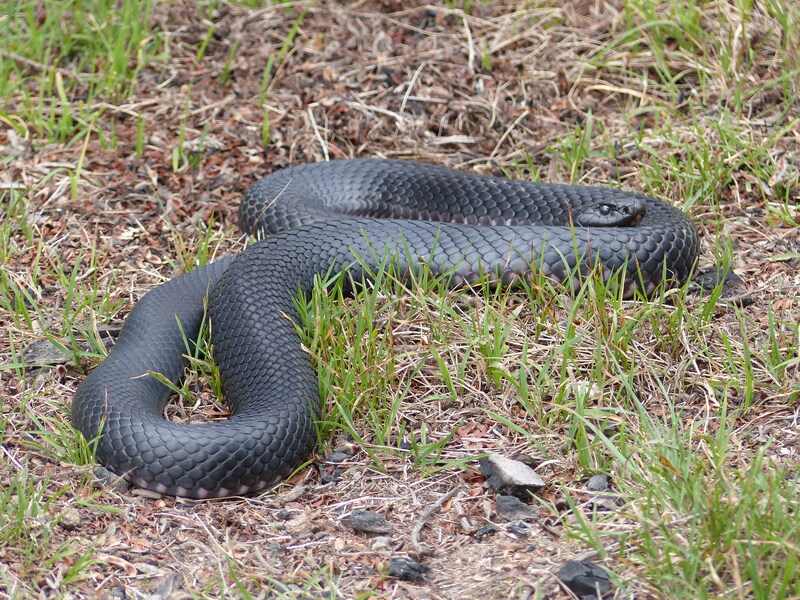 One of the biggest Tiger Snakes I’ve ever seen was while working for Parks Vic in Wilson’s Promontory and the body of this snake was as thick as my arm! When we accidentally startled it (and ourselves!) it just raised it’s head and looked at us knowing fully well it could protect itself. We were sure it yawned at us too. 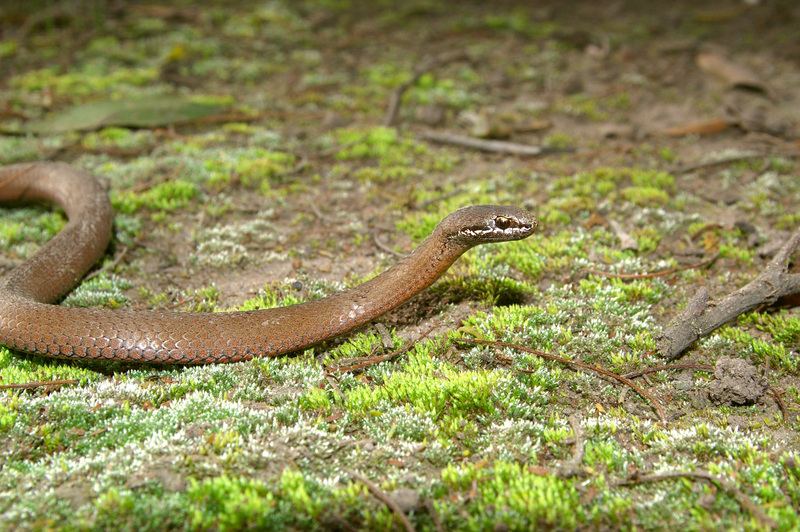 In the same forest near Trafalgar the Southern Water Skink Eulamprus tympanum seemed to be common on logs in open areas. This is a very inquisitive species and I managed to get within 10cm or so from it’s head with my camera. 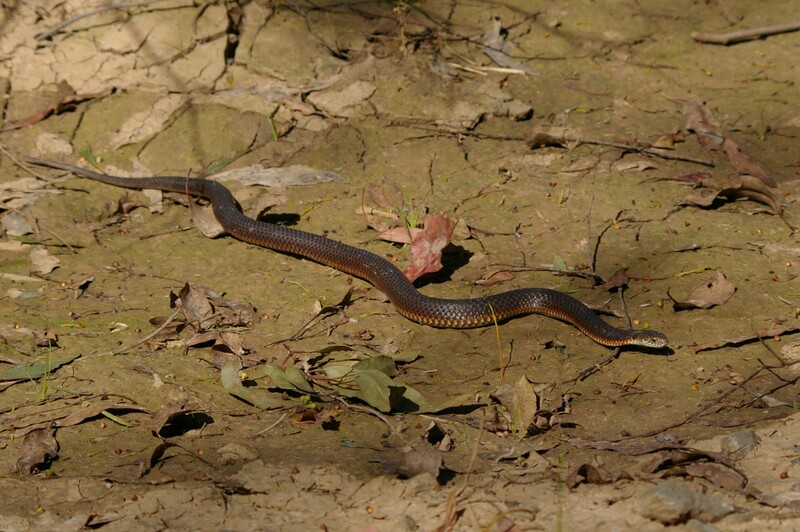 Although it’s called a Water Skink they are often found in areas a long way from any water body. They can, however, swim quite well. 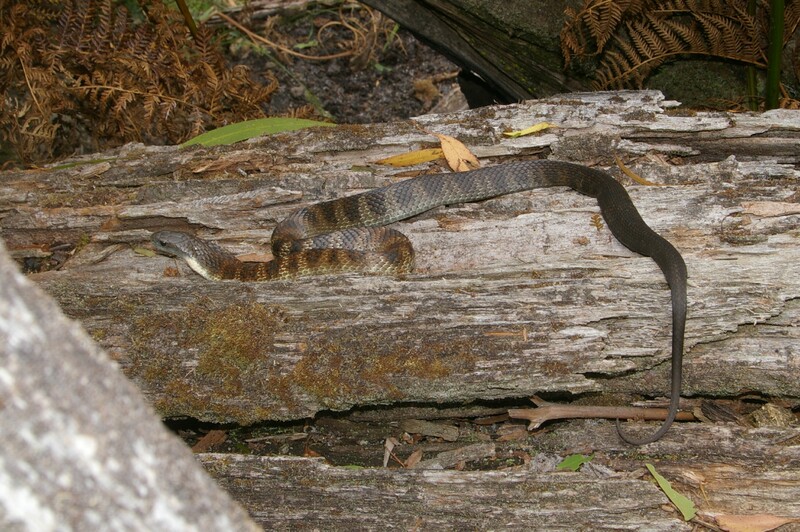 Also in an open area of this same forest was a Blotched Blue-tongue Tiliqua nigrolutea. 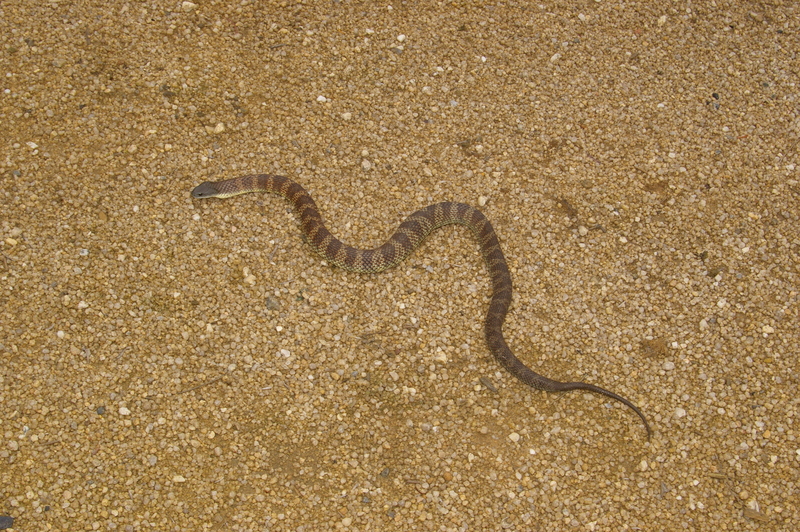 I did mange to find a bright rusty-coloured individual near Bairnsdale last week but I didn’t have my camera with me. 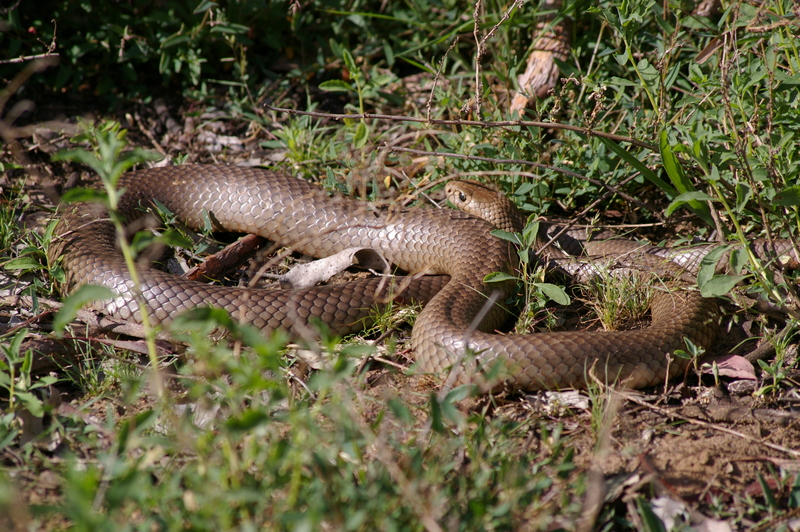 While working for another client yesterday to the west of Golden Beach in Banksia woodland and dry heathy woodland I was surprised at the amount of reptiles around. We have a joke at this site that whenever we say “Gee, we haven’t seen a goanna for a while” we usually see one within a few minutes. This happened to be the case yesterday where we saw not one but two after we said this! This old boy was in an open paddock next to the woodland and was not worried about us approaching it one bit (it actually was falling asleep at one stage while I was photographing it!) They are known as Lace or Varied Monitors Varanus varius and many populations, especially in west Gippsland, are disappearing and as such are listed as vulnerable in Victoria. In an area of Banksia woodland this little fella was found, a young Jacky Dragon Amphibolurus muricatus. 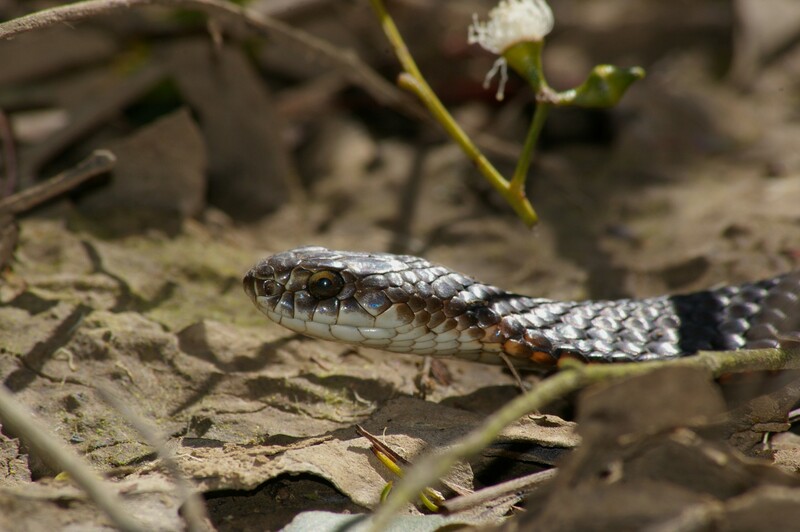 This species can be common in areas of dry forests, woodland and heath. 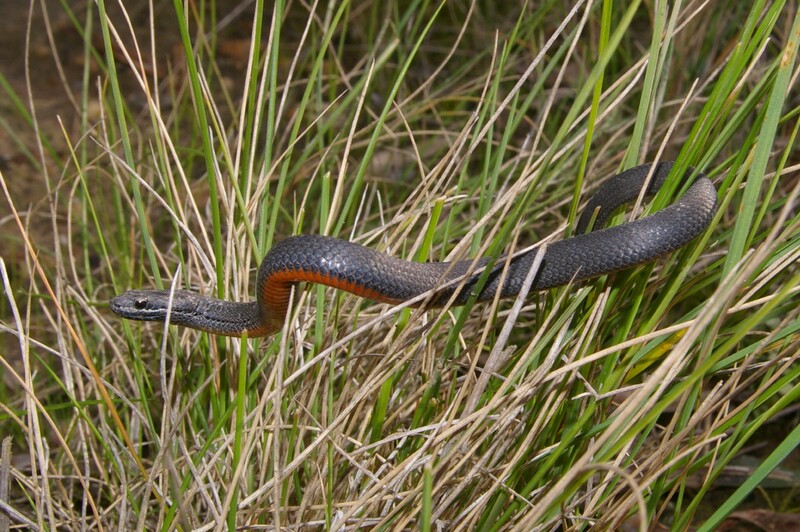 This last one is a common species along the coastal fringe of Gippsland. 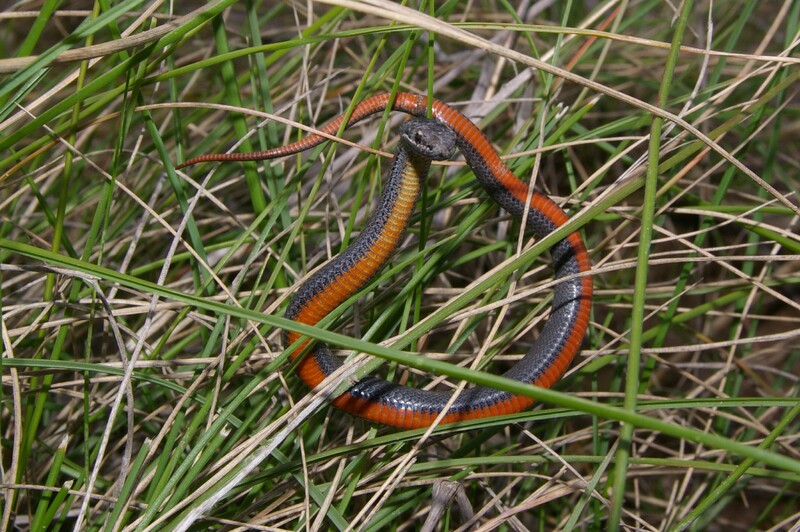 The Eastern Three-lined Skink Acritoscincus duperreyi often has a pinkish-orange throat in the spring breeding season. 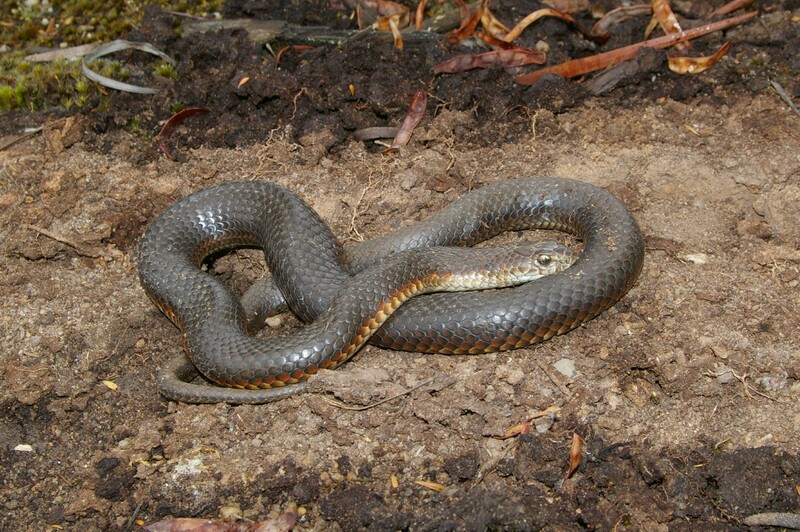 This one was found in coastal dune scrub west of Wonthaggi. 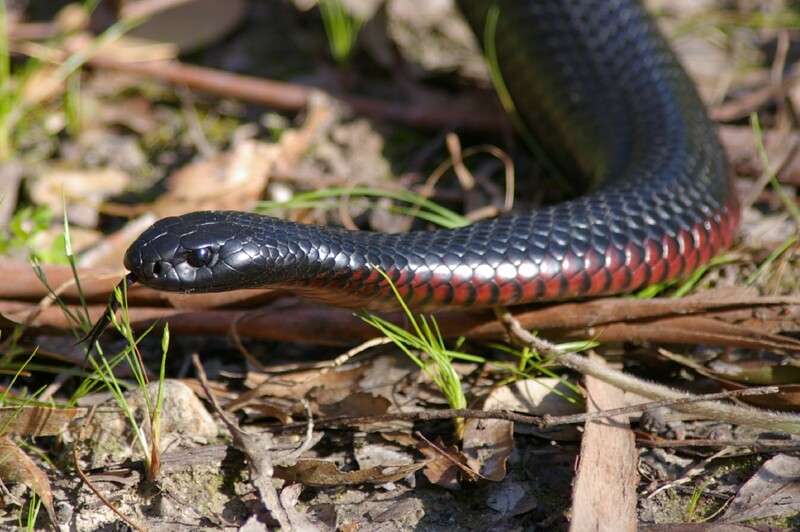 Categories: fauna, gippsland, reptiles, snakes, victoria | Tags: acritoscincus duperreyi, amphibolurus muricatus, blotched blue tongue, eastern three lined skink, eulamprus tympanum, gippsland, jacky dragon, lace monitor, notechis scutatus, reptiles, snakes, southern water skink, tiger snake, tiliqua nigrolutea, varanus varius | Permalink.